Get your business together! In this business model, the business could combine warehouse and office in one place as the focus is on the commercial part – the company develops its sales channels while STAD Logistics Center takes care of the optimal movement and storage of stocks of the company as the company has no store personnel. In that way, our customers’ costs are reduced by nearly 40% and the risks of operating the goods are entirely our responsibility. This further frees resources (financial, human and time) of the company-tenant, which it could use to increase its market shares. Other research, done in this direction, proves that the fixed costs are extremely low when this model of full logistics service is used. In this way, the company takes advantage of the fact that at any moment, it pays at preferential prices only that what it actually uses at the moment (such as warehouse storage space and logistics operations by volume). Also, dips and peaks in the business are optimally serviced without unnecessary resources. The synergy between warehouse, office and full logistic services for the specific needs of each customer of the complex is complemented by the transport services with own and hired vehicles that we offer. At preferential prices for tenants of the complex, we make international (full and partial shipments), as well as domestic transportation in Bulgaria. The domestic distribution is another key point of our activity. The concept of “get your business together” has its total expression in this modern complex. Unique for the tenants is the opportunity to gather their staff and products in one place, as the employees enjoy luxury, class A offices, and our team of professionals in logistics takes care of the goods of the company. When renting a warehouse + office, the client receives a preferential price. Along with additional bonuses for renting office and warehouse space, in the price is included full Property, Facility and Logistics Management of the complex. The complex offers designer commercial areas, a showroom, developed with a stylish atrium on the ground floor and above it. Adjacent is a bank hall, and on the top floor is located a panoramic restaurant with a terrace. There are guaranteed parking spaces underground and outdoors. 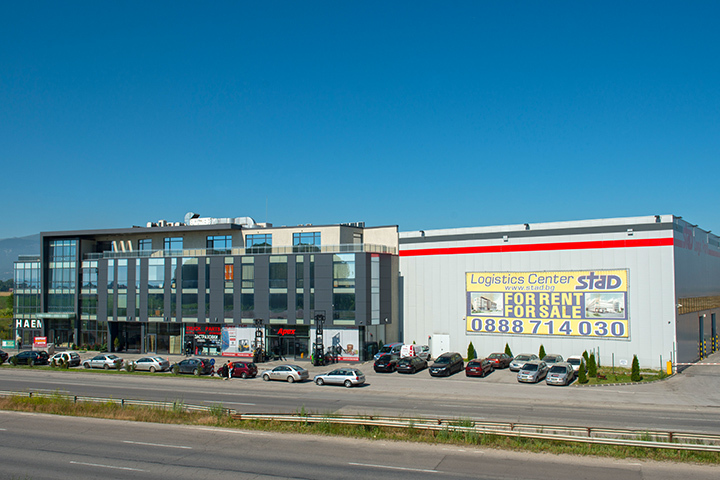 STAD Logistics Center offers a conventional and air-conditioned high-rack warehouse, an office building and fully developed infrastructure including a locale for direct access from the ring road of Sofia, separate parking areas, lawns, an own transformer, an active treatment plant and an underground tank for a fire sprinkler system. The building has four above ground levels and one underground level, where there is a parking lot with guaranteed parking spaces for customers of the complex. On the ground floor, there is a reception, a bank hall and two showrooms connected to the first floor with two designer atriums, allowing each commercial company to display in the best way its products. The Open-Space layout of the space in the complex provides a wide variety of different types and sizes of offices. It is possible also to rent an entire office floor and to flexibly model its space, depending on the needs of the particular tenant. On the top floor of the building, there is a panoramic restaurant with a terrace. The adjacent air-conditioned warehouse is a high-rack warehouse (6000 pallet places) and combines the advantages of a modern warehouse complex – the usable height is 13 meters, allowing placement of 7-floor racks. The point load of the special industrial floor is 9 tons, allowing the storage of heavy goods. Its finishing antistatic covering allows smooth storage of electronics and other specific goods. There are separate “value added” areas which are for commissioning, specific handling, storage and shipment of goods. A modern, integrated software system (ERP), which is connected to the systems in the offices, and to the Internet in real time, operates for the warehouse. The system is capable of deriving information about temperature and humidity in the warehouse. Available to the tenants is also modern handling equipment. Along with standard dock ramps, for convenience of our customers, it is also installed the so-called Jumbo ramp that allows easy and quick unloading of bulk cargo compositions and buses. There is a separate area for side unloading of trucks and a bus zone for quick dispatch of emergency shipments. The warehouse has a full firefighting, sprinkler installation “water-air” (ceiling system – according to the strict German standards VDS). You can download our catalog. In it, you can see the available offices, showrooms and stores with their layouts and sizes.